Located in Portland, Oregon and tracing its origins back to 1911, Rose City Motorcycle Club is Oregon's oldest AMA Chartered Road Club. 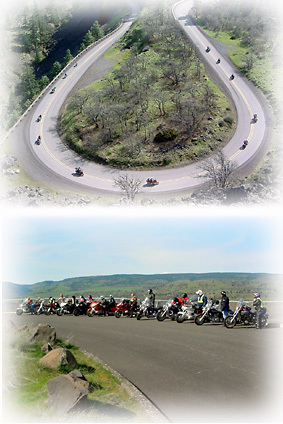 Family oriented, its 130+ members ride a wide variety of motorcycles including touring, cruising, and sport bikes. Rose City MC has a Club Breakfast Social. It is held the 3rd Saturday of each month at 8:00 AM at HomeTown Buffet 3790 SW Hall Blvd, Beaverton, OR. During breakfast we discuss current and upcoming RCMC events. After breakfast we usually go for a ride. Those wishing to join, or just learn more about RCMC are cordially invited to show up and participate. Join us! The Grand Tour, a road tour event, is always held from April 1 to September 30. A fun run of 250 miles is always held the first Sunday in April that is not Easter. This event is a 500 mile tour rally for motorcycles and is not a race. Some Club members on a day ride in the Gorge. A Club Breakfast Social is held the third Saturday of each month. They are held at HomeTown Buffet 3790 SW Hall Blvd, Beaverton, OR at 8:00 AM. We usually go for a ride afterward. Feel free to show up and join! or by calling one of the Club officers. How to become a Member of Rose City Motorcycle Club. Here are the Current Club Officers. Cool Motorcycling and Related Web Sites. To view flyer information you will need the Adobe Acrobat Reader Software which can be downloaded free by clicking in the icon below.